Working Preachercommentaries, podcast, app, etc, 2018. "The Way of Exclusion," Kathryn Matthews, SAMUEL Sermon Seeds, etc, 2018. Faith in Process, Marjorie Suchocki, 2018. "Bartimaeus Bar-Timaeus and the Joy of Faithful Disobedience," D Mark Davis, raw translation and exegesis/questions, Left Behind and Loving It, 2012. The Adventurous Lectionary, Pentecost 22, Bruce Epperly, Living a Holy Adventure, 2012. Social Justice Lectionary, Dr. Bruce Sweet, 2018. Points for Preaching and Teaching, The Lectionary Lab, Proper 25B, the Rev'ds Dr. John Fairless and Delmer Chilton (aka "Two Bubbas and a Bible"), 2012. Girardian Reflections on the Lectionary, Proper 25, by Paul Nuechterlein & Friends. Jesus Now, Proper 25B. Lectionary, study and worship resources from Faith Futures Jesus Then & Now. Rumors, for October 25, 2009, Ralph Milton, "Sermon helps for preachers with a sense of humor." "Let Me See Again," Debie Thomas, Journey with Jesus, 2018. "Reformers in our Midst," Karoline Lewis, Dear Working Preacher, 2018. A Plain Account Wesleyan Commentary, 2018. "New Covenant," Glenn Monson, Law & Gospel Everywhere, 2018. "On the road with Bartimaeus," Andrew Prior, 2018. Monday Meditation, Gary Neal Hansen, 2018. Pray As You Can, Reflections, commentary, prayer, poems, etc., Kym Harris, Diocese of Rockhampton, 2018. "Ten Minutes on a Tuesday," a weekly resource for preachers and worship leaders, The Methodist Church of New Zealand, 2018. One Little Word, David J. Risendal, 2018. COSLC Grace Notes, Pastor Dan Bollerud, Christ Our Savior Lutheran Church, Anchorage, AK. Meditations & poetry, 2018. "No More Silence," Karoline Lewis, Dear Working Preacher, 2015. "Eye Spy," commentary and discussion, RevGalBlogPals, 2015. "Blind Bartimaeus" Dan Clendenin, The Journey with Jesus, 2015. 2012. 2009. "Seeing through the metaphors," Andrew Prior, One Man's Web, 2015. "The King's Valedictory Sermon," Peter Lockhart, a different heresy, 2015. "Let Me See Again," Bob Cornwall, Ponderings on a Faith Journey, 2015. Bartmimaeus...the Entertainer?, Lynn Miller, Art & Faith Matters, celebrating our creative and living God by generating art and architecture resources for congregations and individuals. Art and Faith Matters facebook page contains additional resources. "Keep Reading," Joel Shuman, The Ekklesia Project, 2015. "Blind Bartimaeus," Suzanne Guthrie, At the Edge of the Enclosure, 2015. Peace on Justice, Barbara Born, 2015. "Insulted by Christ?" Glenn Monson, Law & Gospel Everywhere, 2015. "The Politics of Discipleship," Robert Williamson, Jr., Political Theology Today, 2015. "Name That Sermon!" Alyce M. McKenzie, Edgy Exegesis, 2012. "Home is often a troubled place," John Jay Alvaro, Ekklesia Project, 2012. "Hurting Together," Melissa Bane Sevier, Contemplative Viewfinder, 2012. "Could We Also Regain Our Vision?" Peter Woods, I am listening..., 2012. "We are top of the league," Neil Chappell, aweirdthing, 2012. "When Wilt Thou Save the People," Robert Cornwall, Ponderings on a Faith Journey, 2012. "In Bartimaeus' Shoes," by MaryAnn McKibben Dana. A Sermon for Every Sunday. Video sermons from America’s best preachers for every Sunday of the Liturgical Year. "The Book of Job, Part IV," by Amy Butler. A Sermon for Every Sunday. Video sermons from America’s best preachers for every Sunday of the Liturgical Year. "Home Repair 101," Matt Gaventa, Day1, 2018. 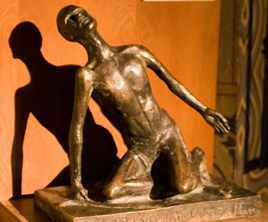 "Bartimaeus," Frederick Buechner Sermon Illustrations. "Surviving Seeing," the Rev. Dr. Kimberleigh Buchanan, Day 1, 2012. "The True Universal Health Care," the Rev. Susan Sparks, Day1, 2010. "I Just Can't Imagine," the Rev. Dr. Robin Meyers, Day 1, 2006. "Is My Religion Better Than Yours?" Jaime Clark-Soles, ON Scripture, Odyssey Networks, 2015. Includes discussion questions. Video: "An Interfaith Tour." Estudio Biblico, Proprio 25B, Sermones que Iluminan, Episcopal Digital Network, 2015. "Take Heart" Weekly Seeds, UCC, 2015. Preaching Helps and Worship Resources, Rev. Dawn Chesser, Taylor Burton-Edwards, Dean McIntyre, Prayers, Lectionary Hymns, United Methodist Church General Board of Discipleship. Liturgy and Hymns, Stephen Fearing, 2018. Sacredise Lectionary Worship Resources, 2015. Ministry Matters, October 25, 2015. Mustard Seeds, "Going against the Flow, Risky Discipleship," Proper 25, 2015. A lectionary-based ideas resource for leaders of contemporary worship, Ann Scull, Gippsland, Australia. LCA Worship Planning Page, Pentecost 22, 2015, "Everything lay-readers need to prepare worship." Liturgy for the Celebration of Life, Pentecost 22B, 2012. Liturgies from a Progressive/Post-Liberal Theology, Revd Rex A.E. Hunt, Uniting Church in Australia. Worship and Liturgy Resources, Ordinary 30, by Rev David Beswick, Uniting Church in Australia. Lector's Notes, Ordinary 30, Gregory Warnusz, Saint Jerome Parish, Bellefontaine Neighbors, MO. Notes and commentary for those reading this week's lectionary texts to the congregation. "Liturgy: prayers reflection," reflections on the collect at the Eucharist, NZPB, (TEC BCP USA, ICEL) Rev. Bosco Peters, New Zealand. The Timeless Psalms: Psalm 126, Joan Stott, prayers and meditations based on lectionary Psalms, 2015. Weekly Evangelectionary, Bruce Laverman, Evangelism Connections, 2015. Reflection on shared collect, Bosco Peters, liturgy, 2015. HermanoLeón Clipart, Ordinary 30B. Free clipart, backgrounds, slides, etc. Clip Art, Ordinary 30, Fr. Richard Lonsdale, Resources for Catholic Educators. 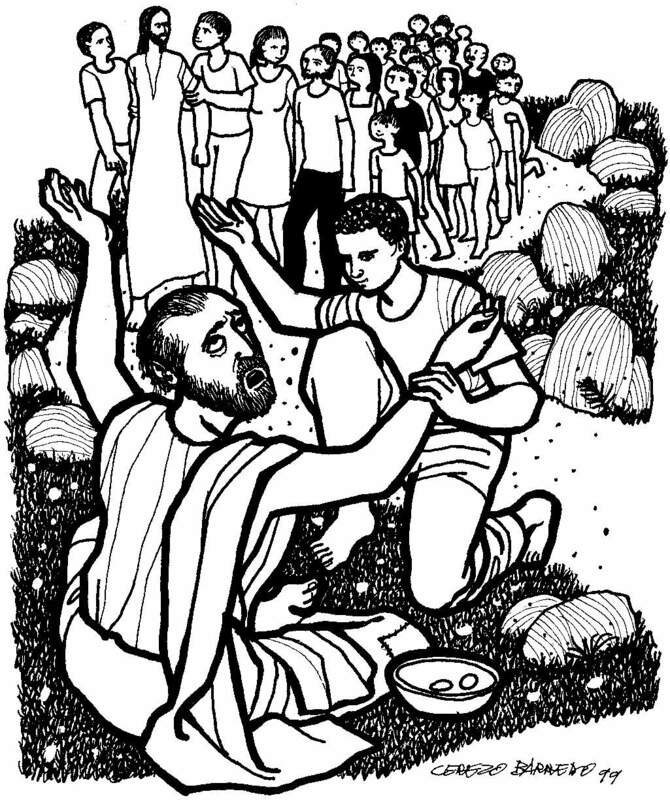 Clip Art Images: Mark 10:46-52, Misioneros Del Sagrado Corazón en el Perú. Ordinary 30 at Cerezo Barredo's weekly gospel illustration. Follows Latin American Roman Catholic gospel reading, though most gospels texts/themes are found in the index. Liberation emphasis. "God's Return Policy," Gregory Lee Cuéllar, ON Scripture, Odyssey Networks, 2012. Video: Clergy Take a Non-Partisan Approach to Discussing Immigration Reform at the DNC. "No Answers but Presence," Faith Element Discipleship System, "Setting the Bible Free," 2012. "Jesus, Have Mercy!" a hymn by Carolyn Winfrey Gillette, celebrates Jesus' healing of Bartimaeus and is a prayer for the church today to have new visions of faithful living and service. Tune: BUNESSAN ("Morning Has Broken"). “In Cana at a Wedding Feast,” by Carolyn Winfrey Gillette, Jesus' miracles (healing of Bartimaeus, water into wine, feeding thousands, and calming the storm) are celebrated as signs of God's love in the world. Tune: ELLACOMBE 8.6.8.6 D (“I Sing the Mighty Power of God”). This hymn is in Singing the New Testament by the Calvin Institute of Christian Worship. "Mercy," Brenton Prigge, 10 11 11.7, New Hymn, 2006. Hymns of the Spirit Three, Proper 25B, Richard E. Hurst, Universalist National Memorial Church. Psalm Settings by Dale A. Schoening, Metrical Psalms: Psalm 34:1-8, 19-22 set to Dix (77 77 77), Psalm 126 set to St George's Windsor (77 77 D). Hymn and Song Suggestions, Proper 25B, 2012, annotated suggestions from Natalie Sims, Singing from the Lectionary. Hymn and Song Suggestions, Pentecost 21, 2009, annotated suggestions from Natalie Sims, Singing from the Lectionary. Lectionary Hymns, Ordinary 30B, National Association of Pastoral Musicians. Choral Anthem Project, Ordinary 30B, National Association of Pastoral Musicians. Sing for Joy, Lectionary 30, 2009. Choral reflections on this week's lectionary readings, St. Olaf College. Together to Celebrate, 2015, David MacGregor, Uniting Church in Australia. Contemporary Christian Music resources. Worshiping with Children, Proper 25, 2015, Including children in the congregation's worship, using the Revised Common Lectionary, Carolyn C. Brown, 2012. Dollar Store Childrens Sermons, John Stevens, 2018. "The Outfit of Love," Frances Woodruff, On the Chancel Steps, 2012. Spinning Top, Dollar Store Children's Sermons, 2015. Ministry Matters, October 28, 2012. Story for Children's Worship and Family Activity, Ordinary 30, at word-sunday.com: A Catholic Resource for the Lectionary by Larry Broding. Mustard Seeds, "Going against the Flow, Risky Discipleship," Proper 25, 2012. A lectionary-based ideas resource for leaders of contemporary worship, Ann Scull, Gippsland, Australia.